Yesterday I talked with a friend who is back in the stifling summer heat of Milan for a wedding. I was taken back to my time living there and how the two of us realised we were living just down the road from each other, friends from school who had fallen out of touch. I could see her as clearly as if it was yesterday, in gumboots on the side of Viale Gran Sasso in the slushy grey snow as she waited for me. We were getting our first of many espresso together in the city we Kiwis were choosing to call home. Sometimes it seemed like we were the only sane ones in the whole city, other times it seemed like we were the ones creating all the drama. I was taken back to the friendships and the adventures, the flavours and fragrance of an Italian kitchen. The bag of tomatoes in my fridge were calling to me and I knew what I had to do with them. Cover the bottom of a thick bottomed pan with olive oil and then add your whole garlic clove. When you can start to smell the garlic, add the chilli flakes and anchovy fillets and slowly slowly fry these until they dissolve into the oil making a delicious salty, spicy and garlicky oil (I have been known to finish here and coat the pasta with the oil for dinner. If I learnt one thing from Italy it is that simplicity is always best). Next, finely dice the red onion and add this with the lemon zest to slowly soften in the oil. Fill a bowl with boiling water and drop your tomatoes in. Leave for 30 seconds and then pull out and peel the skin off. Chop the tomatoes up and add these to the onion. There will be a lot of liquid from the tomatoes at this stage, so you want to leave them to simmer and thicken until you are left with a deep red sauce. Add the capers and stoned and cut up olives and you have yourself a sauce. Cook your pasta – I think something long and skinny is best for a sauce like this – and combine them. You don’t want your pasta to be swimming in the sauce, but nicely shiny from it. Top with grated parmesan to really make your meal amazing. 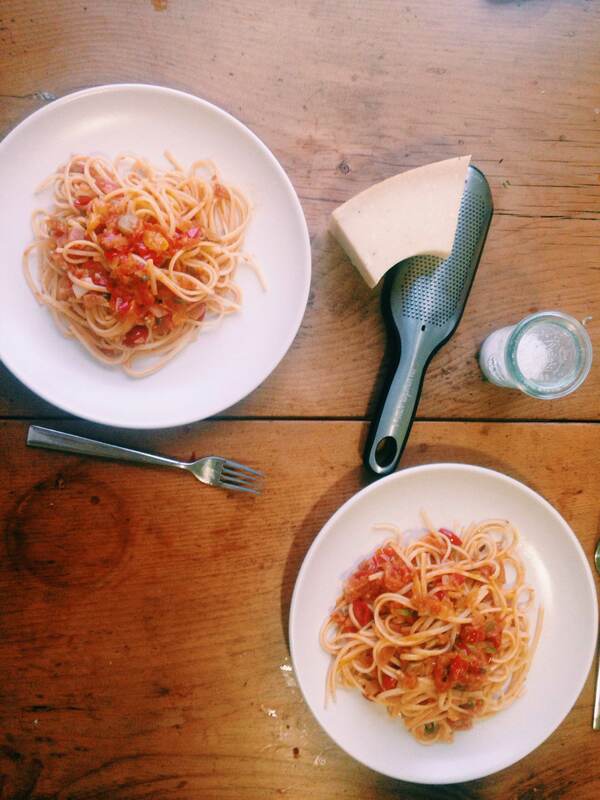 The beauty of pasta al pomodoro is that there is no one way to do it. I am sure there are many nonne out there who are shaking their heads at this recipe, but there seem to be hundreds of variations on eating tomatoes and pasta together. It can be as simple as oil, garlic and a tin of tomatoes. Either way, you know it is going to taste gooooood. It is my go to food, my comfort food and my favourite dinner in the world. Plus, I can put away serious amounts. Very happily. While the pasta cooked, we had a little marinated zucchini salad which was a lovely combination of fresh crunch, zingy vinegar and soft mozzarella. Finely slice the zucchini and put in a bowl with the olive oil, garlic, basil, lemon juice, vinegar and salt. Leave these for a couple of hours to marinate. 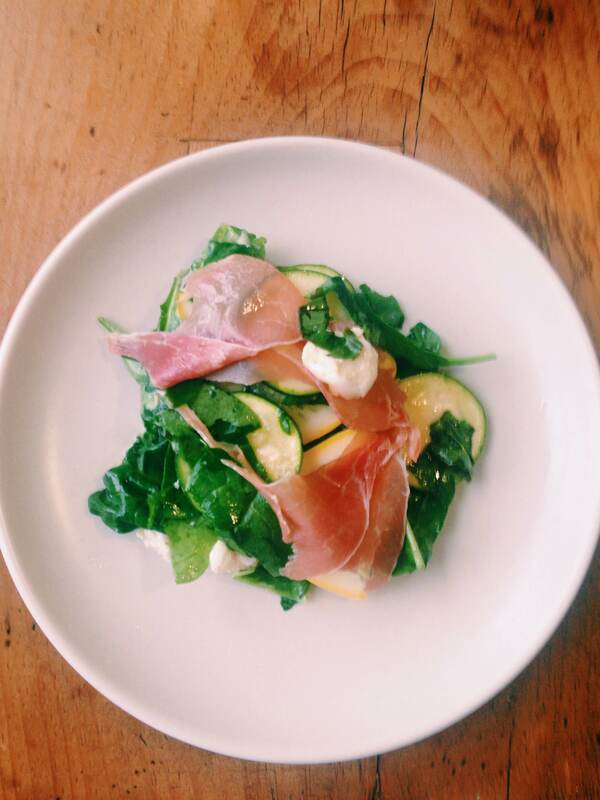 Just before you serve, add the baby spinach, prosciutto and mozzarella. Easy as that.